…and began our long voyage to northern Illinois. The November chill had already conquered much of the southeast. The still-green leaves in Atlanta belied the fact temperatures had already scraped the bottom of the low-30’s barrel just one night earlier. Ill-prepared citizens hurried in hoodies and cargo shorts into their cars. Everyone had expected the usual late-year heatwave to hit. It didn’t much matter to me and the G Man. With a fistful of snacks and a fully-charged Nintendo Switch, my son climbed in the backseat, buried his knees beneath a winter blanket, and settled in for the long haul without complaint. His was the best spot from which to enjoy a road-trip, and he knew it. As for me, I began our little adventure steeping in the fumes of two hours’ sleep, no dinner the night before, and a headache straight out of Hades. No matter. I was as ready as I was ever going to be. Like a stone shot from a cannon, we tore up the highway. …a huge traffic wreck just ten minutes removed from our starting point. “Dad, what’s that?” the G Man looked up from his game. “An upside-down tractor-trailer on fire beneath a bridge.” I stared at the awful accident. Well. I figured if he could be nonchalant about spending the next hour sitting in a huge traffic jam, so could I. Traffic cleared. Cars moved. And after a long wait, again we flew. Twelve hours, we drove. Two pit stops. Two gas refills. One bag of Twizzlers. A giant orange Fanta. Thousands of slow cars passed in the pitch-black of the Indiana expressways. And there we slept, in a neat, new Hampton Inn tucked away in the modest commercial heart of Minooka, IL. The G Man and I awoke late in the morning, feeling almost jet-lagged by the long drive. Sure, we’d gained an hour by crossing into the Central Time Zone, but who knew how exhausting sitting in the car for seven-hundred fifty miles would make us? A little spacey, a lot hungry, we jetted over to meet our much-beloved Aunt Patty for breakfast at a little diner known as The Crispy Waffle. But wait. What’s this? As we set off into the morning, it hit me. We weren’t in the south any longer. No, it wasn’t particularly cold. No, the wind wasn’t as vicious as we’d expected. It was something else entirely. It was the sky, slate grey forever in each direction. 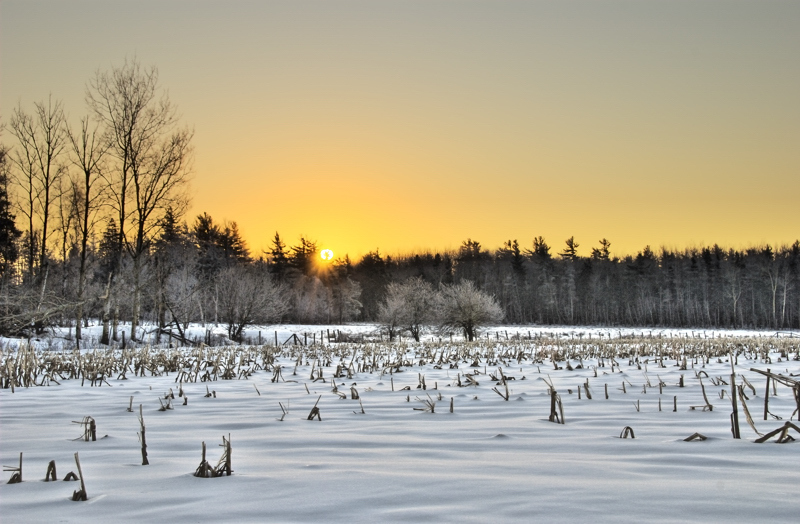 It was the stillness of everything, the endless fallow cornfields, the trees looking far more brittle than any southern boy could comprehend. It was…home. In the town in which I grew up (Joliet, a few minutes southwest of Chicago) entire autumns and winters passed in this cold, grey atmosphere. I took one skyward glance on our first morning, and I remembered. At night in the Midwest, you can gaze across the fields and see lights from houses many miles away. During late autumn afternoons, the world always feels five minutes from dusk. Whether it’s 1PM or 5PM, twilight is just around the corner. And sometimes, if you step outside alone at night, you hear nothing. Not the wind. Nor a stray cricket. Nor the everlasting rustles of southern wildlife. You hear nothing. It’s both eerie and invigorating. Minooka in winter. Actually, everywhere in Illinois in winter. So…The Crispy Waffle. Five-thousand pancakes. Two-billion strips of bacon. Many hugs with Aunt Patty. It was G Man’s first encounter with this part of our family, and his usual shyness was absent. Our first reunion…a success. Aunts are wonderful creatures to be loved and cherished. And Aunts named Patty? Solid. Friggin’. Gold. Our first afternoon, with bellies full of food, we drove through the cold. It seemed to get colder as the day aged. The wind picked up and the clouds gathered into great grey masses. Every moment we spent outside, I continued to recall the long days of my youth. I went back in time, so to speak. After our pleasant-to-the-bone breakfast, the G Man and I treated ourselves to a movie – Ralph Breaks the Internet. To be fair, it wasn’t as epic as the original. But somehow, watching a movie with a laughing, smiling seven-year old makes ALL movies good. And that’s all I have to say about that. Despite the near-freezing temps, we next visited a park. We were the only ones outside. Absolutely, the only souls in sight. Another silent moment hit us. Even Garrett felt it, standing there in the soundless dirt, hiding from me atop a four-story high slide…he knew it. I saw him understand the difference between Atlanta and Chicago. We left the park behind. And next came a truly heart-rending experience. See, not far from yon park lay a street – Lilac Lane. And it’s there on Lilac Lane I had once (thirty-five years ago) spent the most glorious days of my youth. I could write whole volumes of my love for that little street. (If you really want to read about it, go here.) I just had to take G Man for a drive-by, however brief, and look upon the house between whose walls I lived for many a perfect season. We drove slowly up Lilac Lane and crawled to a stop not twenty feet from the driveway I’d run up and down a thousand times. I couldn’t do it. I couldn’t stop and get out to look at the house. I couldn’t look upon it for longer than one fleeting moment. The G Man must’ve wondered what was wrong when I tapped the gas pedal and announced we were going back to the hotel ‘for a break.’ It was a moment…and then it was gone. I can’t say more about that part of the trip except to note the house on Lilac Lane was once my grandparents’, both of whom are gone now, and both of whom I loved to pieces. It was a hard thing to do, stopping by for a look, and most unexpectedly it hurt. Our first night was quite a bit less somber than the afternoon. We headed to an old, old friend’s house, the best of friends, and we sipped scotch, ate Italian food, and sat before a sizzling fireplace. At one point, my friend’s wife snatched up a glass of unattended (and powerful) 14-year scotch, and simply destroyed it. The world felt right. And yes…it was good to be among friends again. The plan was simple: Wake up late. Eat no breakfast. Head to Aunt Patty’s house for about ten hours of football, whiskey, laughter, and food. And boy did we live it up. Despite the G Man waking up a bit groggy, we headed once more across the grey-shrouded lands and arrived at a house I hadn’t set foot in for decades. The G Man arrived to a box full of gifts (because that’s what family does to kids – spoil them) and I arrived to such hospitality I’d rarely experienced. Let’s be honest. Day 2 was a blur from which our stomachs will likely never quite recover. We were again reminded what it’s like to be among family. And while some families may war and bicker, on this day ours was at peace. …except for that one time my uncle sucker punched me in the back of the head. We knew as we awoke this would be our final day in the north. And so we knew we had to enjoy it. And yet…as I awoke, something felt off. See, long before hatching the plan to come north, I’d been thinking of a way to encounter…a girl. Yes. A girl. My secret reason for driving so far in the cold. A girl from the north. A girl who happened to live in Minooka…not five minutes from our hotel. I hadn’t told the G Man. In fact, I hadn’t told anyone. It was a long-shot from the beginning, a heart-achy plan half-baked over the course of what felt like centuries. Even as I dressed for our third night of trouble-making, I must’ve looked distracted. Torn. Absent from thought. And yet, it so happened my plans to collide with the heartache-inducing lady completely collapsed. Died on the vine. She either didn’t want to see me…or couldn’t. This is how it went, how it always goes, and how I knew all along it would go. Have fun tonight. It’s your last night here. Be present. And for the most part, I was. Another Midwestern field. 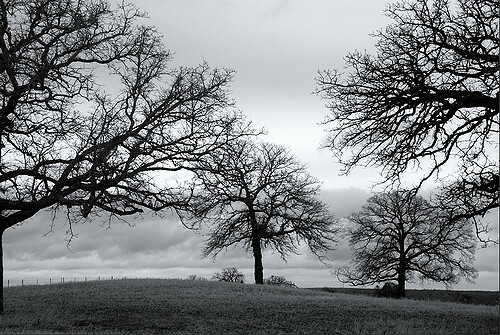 Wintered trees. Dry, brittle grass. Grey clouds in every direction. And so, in a rare mood, we drove out to another friends’ house. It was a short journey, only minutes from our hotel. A log cabin surrounded by fields. Several friends I hadn’t seen in eons. What a night it was. The finest fried chicken chef in the north stood not ten feet away, preparing buckets of chicken, mashed potatoes, sweet corn, rolls…and more. Someone kept topping off my wine. Someone else brought me a shot of bourbon…and delivered unto the G Man a fistful of sweets. I ate more food than I’d ever eaten in one sitting. Afterward, with a beard tainted by pumpkin pie, I visited my friend’s father’s workshop. I discussed heartbreak with the ladies. I topped off one final glass of wine. And I distributed a few small gifts to the warmest crowd the world has ever known. Sometimes, home isn’t home because of the place. It’s the people. And for one night, I thought nothing of grey skies, fallow fields, and daydreams of romance. I sat among my life’s best companions and remembered for one small moment what it felt like to be loved. We woke early. Too early. We wanted to drive fast and make it home in time for relaxation. And so we did, blazing back down to the south using the exact same roads we’d used just a few days earlier. We saw giant wind farms. Empty stretches of nothing. Old barns. Older churches. And cows…lots of cows. 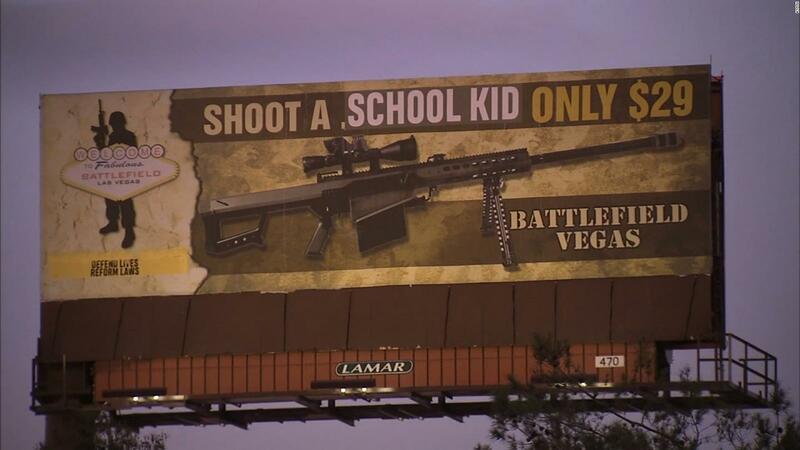 In the Deep South, especially southern Georgia, there exist billboards by the hundred. Billboards for Jesus. Billboards for the Lion’s Den (a creepy truck stop with naked girls…we think.) Billboards for peanuts, pecans, and the end of the world. In the Midwest, the billboards are much, much fewer. And so I think the journey though the north, while not exactly stuffed with exciting views, is better for it. 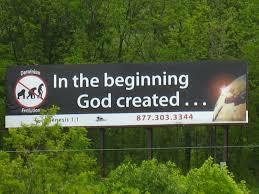 Because really…who needs to see one-hundred consecutive billboards regarding humanity’s descent into Hell? Thankfully the Midwest has fewer of these. …though I’m not exactly sure why. And so our Midwestern adventure came to a quiet end. At 8PM Saturday night, we rolled into our familiar driveway. The leaves had browned and fallen in great number during our brief absence, and the cold had moved in. Our cats were happy to see us. Our house was clean and warm. The G Man, having never once asked ‘Are we there yet’ during twenty-two hours of driving, was rewarded with a movie. As for me, I suppose I must’ve sat quietly for nearly an hour after arriving. The Midwest was gone again, and the skies were back to their familiar southern haze. I missed the girl, but I’ll always remember the family and friends. Perhaps we’ll go back again soon. And maybe it won’t be as huge a culture shock to return to the land I once knew and loved. I write plenty of stories that aren’t about cornfields, clouds, and overeating.